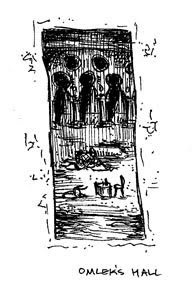 Omlek's Hall is a considerable delve generally declared to be a Dwarven City, though a brief exploration will dispell this myth, for the doorways are tall and narrow, and the ornamentation is rather un-Dwarfish. Only its upper levels have been explored, and its original builders are a mystery. The only known entrance is a narrow window in a cliff face. Bandits sometimes use the upper halls as a base, but the narrow entrance means that only lightly armored or small size persons can easily enter and exit. Tony, this one is a bit difficult to see, especially given the different view or scale. Any chance you could scan it larger or at a higher rez? Hmm... thanks for spotting that. i changed some scanner settings. That must be why.